Community RePaint, the UK-wide paint reuse network, helped to make Britain a brighter place last year by supporting over 12,000 groups and people to transform their local environment. 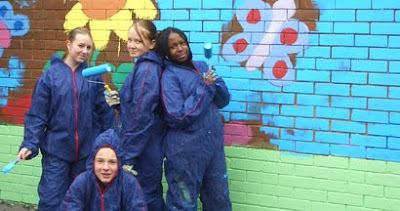 The network re-distributed more than 215,000 litres of leftover, reusable paint across the country in 2010, to projects such as the makeover of the children's ward at Newham University Hospital, London, which was carried out by young people participating in the Prince's Trust Team Programme. "As part of the programme the team choose a project that will have a long lasting benefit for the community and then set about raising funds to make it possible,'" explained Team Leader, Ben Adefisan, "By using paint from our local Community RePaint scheme we were able to create a bright and welcoming environment for the children on the Rainbow Ward and still have money for the other materials that we couldn't otherwise afford." "Andy is a 41 year-old man suffering from mental health problems, who, for a number of reasons, no longer felt safe in his home, but could not afford to move," said Community RePaint's Manager Martin Pearse. "We were able to help him to re-decorate his flat and improve his living conditions by supplying paint that would have otherwise ended up in landfill."